How Can My Environment Help Me? Who is the Vastu Purush? The subtle cosmic being, the Vastu Purush connects your space, in any room, apartment, house or building to your very self.Vastu purush’s human shape represents your living space, as a living being with consciousness and life energy. His anatomy corresponds to the qualitative structure of space. He lies on a geometrical grid which symbolises the strict geometrical spatial order in alignment with the cosmic pulse. You can see in the chart above the eight compass points of the building with Vastu purush’s head towards the Northeast. As a Symbol of Life Space, he is maintained by the bio energy fields of any given space which are influenced by the Five Great Elements, nine planets (Nava Graha), and the Devas (celestial rulers). When energetic (elements) karmic (planetary) and geophysical imbalances within any part of the building do not support the cosmic balance of energy flow, the Vastu Purush will to attempt to maintain order. How? He will draw upon the energy field of the inhabitants to harmonise and compensate for the defect! Vastu studies have shown that the result of this exchange of energies over a long period of time can cause depletion, stress and disturbances in the bio energetic field of our own body. 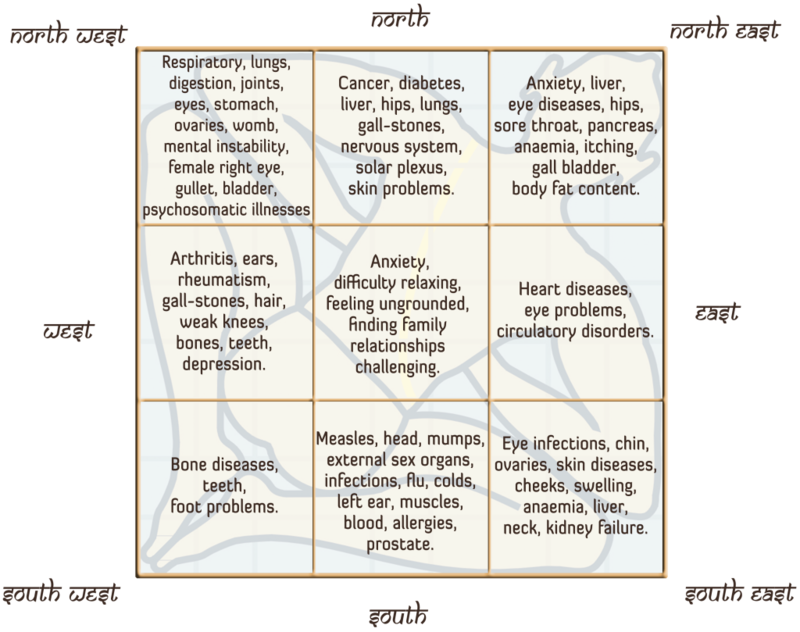 This manifests as various illnesses and affects various organs in the body. If you have any of these health issues please check the eight compass points of your building. Adjust your home and business according to the guidelines wherever possible by honoring the Twelve Laws of Success for Healthy Living and Building for not only your good health but for so many other aspects of your life. It is very important to keep the Vastu Purush satisfied. You may want to implement the remedial vastu tools in the shop to assist you to transform your space, and preserve your good health and peace of mind. Please leave your comments or questions below or contact me for more guidance should you need. How Can You Energise Your Home? When houses or offices are built without considering the harmonisation of Nature’s multifarious influences, it is usually impossible to change certain structural and physical attributes, for instance the building orientation and shape of the entire building. However, there are many other physical and subtle ‘to do’s’ you can see listed below. These can be implemented or suggested during your Vastu Consultation to maximise positive energy flow within your space. Some adjustments may be considered drastic, while others can be quite simple. If you have the means, they can be well worth the endeavour due to the manifestation of the many positive results in your life. Indoor Structural Changes-put up walls to block negative energy flow or tear down walls to allow the positive to enter and circulate. Changing Room Functions– (see link) swap rooms for Directional Empowerment to better match your individual planetary influences. Balance the Five Great Elements– introduce the five material elements into your space to support the subtle presiding ones in each direction e.g. flowing water feature in the North, whose elements are Air and water, for increased cash flow and improved communications. Correcting with Colours-match the planetary colours of any direction to strengthen your area e.g. Mars presides in the South and the colour is red, offering you prosperity and protection. 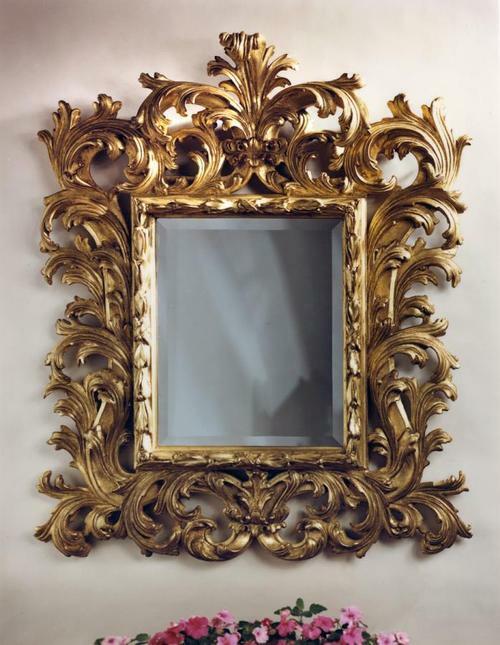 Opening with Mirrors– they act like windows to open up the positive sectors of your space. Adopting Behavioural Changes– e.g. Avoid inappropriate use of ‘negative’ areas that generate inauspicious energy e.g. using an alternative entrance with a more positive energy flow to building. Energising with natural images-e.g. Place photographs, paintings, artefacts or deities which represent the qualities of any given direction. E.g. A Buddha murti in the North or Venetian artefact depicting sensual enjoyment in the Southeast (Venus). 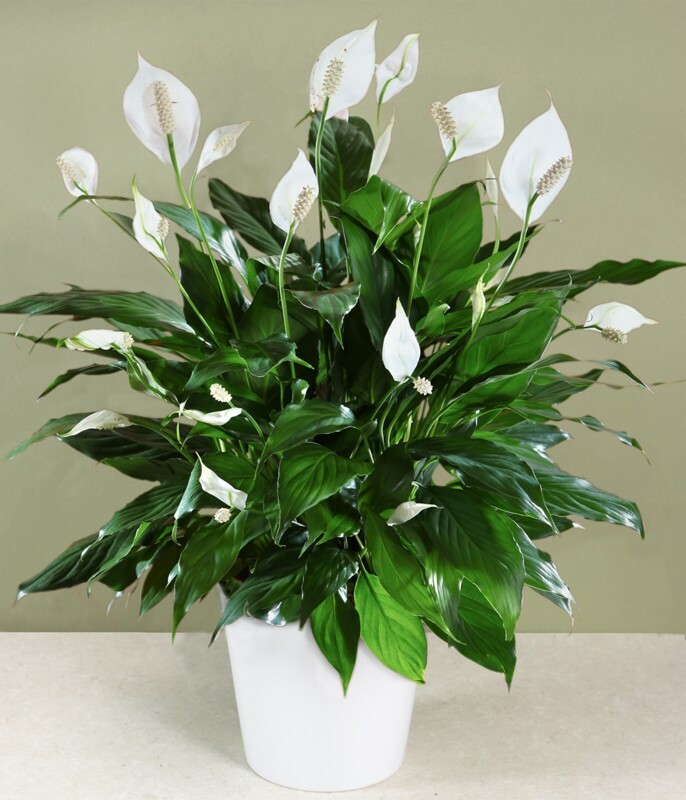 Not only does the Peace Lily send up beautiful flowers, but they’re impossible to kill and have great air cleaning abilities. They flower through most of the summer and prefer shady spots with moist but not soggy soil. It removes ammonia, benzene, formaldehyde and trichloroethylene. Using Plants-e.g. Plants can assist to balance the bio-energetic fields, absorb radiation, and clean the air of toxins and chemicals in your space. And e.g. large potted plants with huge leaves can reduce the negative energy potential of negative sectors. Assigning Crystals and Gems-each direction has its own specific crystal or gemstone, which can ‘power’ your space and absorb negativity e.g. in the Northwest the Moon planet’s gemstones are Pearl and Moonstone, which when installed properly, can positively affect our mental and emotional equilibrium, thus provide you with an atmosphere for loving and peaceful relationships. 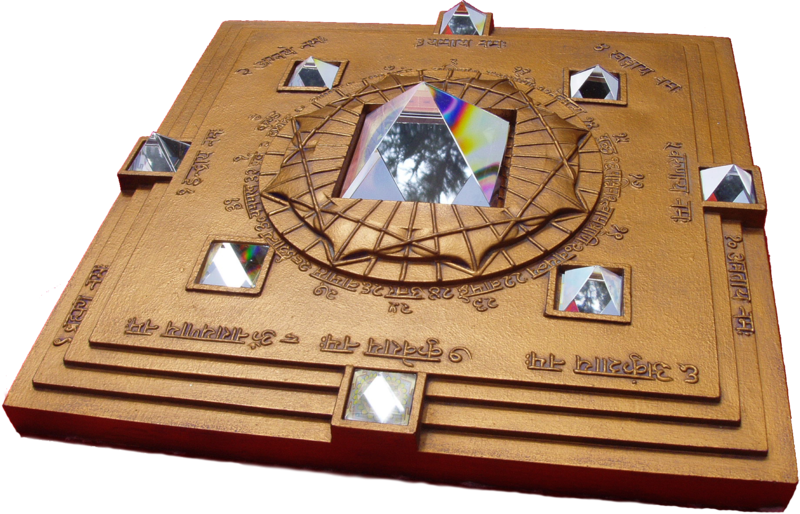 The Vedas explain Shri Yantra as a scientific, cosmic and planetary energy zone and is one of the most auspicious, powerful transformative tools used for obtaining desired consciousness and results. It is proven to be universally beneficial for all. This timeless symbol of good fortune has been used to invoke prosperity and well being, as well as an aid for meditation for centuries. It’s complex geometry is the key to it’s extraordinary effect, transforming and harmonising living spaces as well as counterbalancing a large percentage of energetic disturbances. 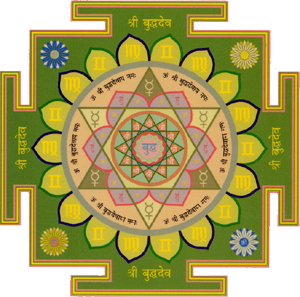 Sri yantra, also known as Sri Chakra, is called the mother of all yantras because all other yantras are derived from it. It is often referred to as the ‘The king of Power Symbols”. Where is it best placed? It is best placed in the Northwest, North, NorthEast or East of your home. In all images the centre triangle with the dot in it usually points downwards, however In Vastu when installing this yantra this triangle should point towards the East for generating auspicious energies. Our universe is composed of the five great elements in perfect proportions and harmony with each other, allowing us to maintain our existence on this planet as we know it. The Sri yantra’s geometry demonstrates the significance of this balance. Point = Energy of the element ether. The centre, there is a big dot (known as the bindu), which is the primordial matter or the starting point of creation resulting from the union of the male and female energies. The triangles are angled in such a way that they produce 43 subsidiary triangles, which form the abodes of different demigods (Universal rulers). 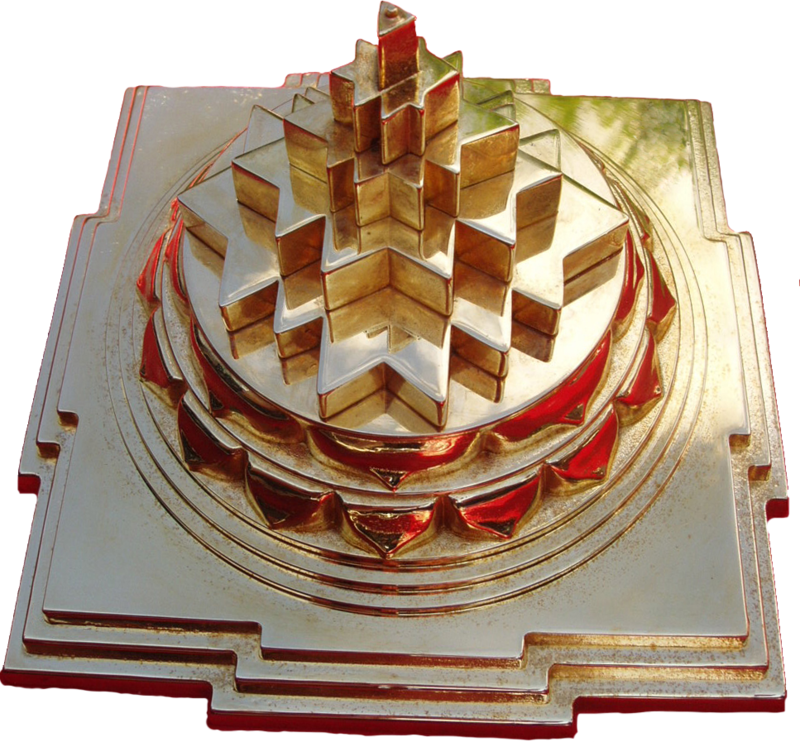 The sri yantra has outer rings consisting of an eight-petalled lotus, enclosed by a sixteen petalled lotus,girdled in turn by three circles, which represent creation, maintenance and dissolution. The lotus flower typically represent chakras, with each petal representing a psychic propensity. They are all enclosed in a square with four doors or gates, one on each side. which represents the boundaries within which the deities reside, protecting you from the chaos and disorder of the outside world. 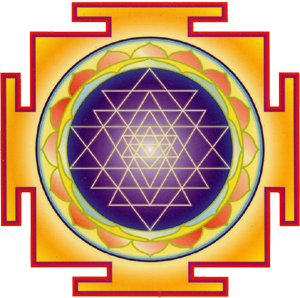 Now that we have familiarised ourselves with the significance of the Sri Yantra geometry, we can better understand the Meru Chakra and how it works.